to the shop's parking lot. 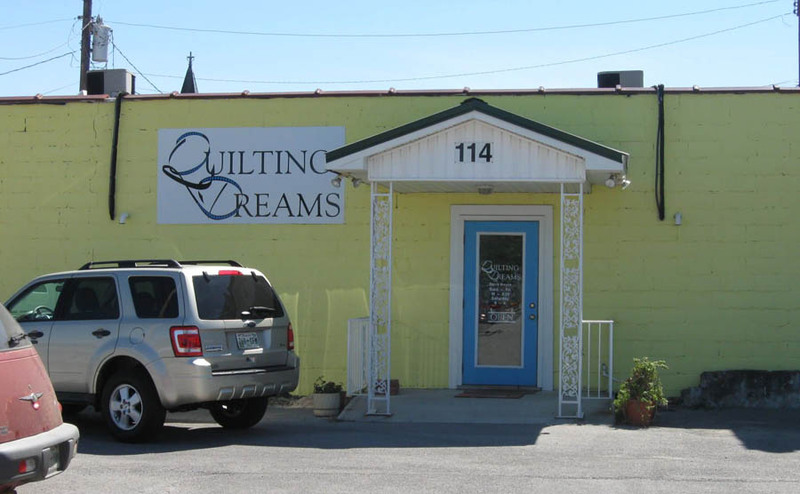 Quilting Dreams, located in the middle Tennessee town of Tullahoma, is a dream come true for owner Jeanette Kiech. 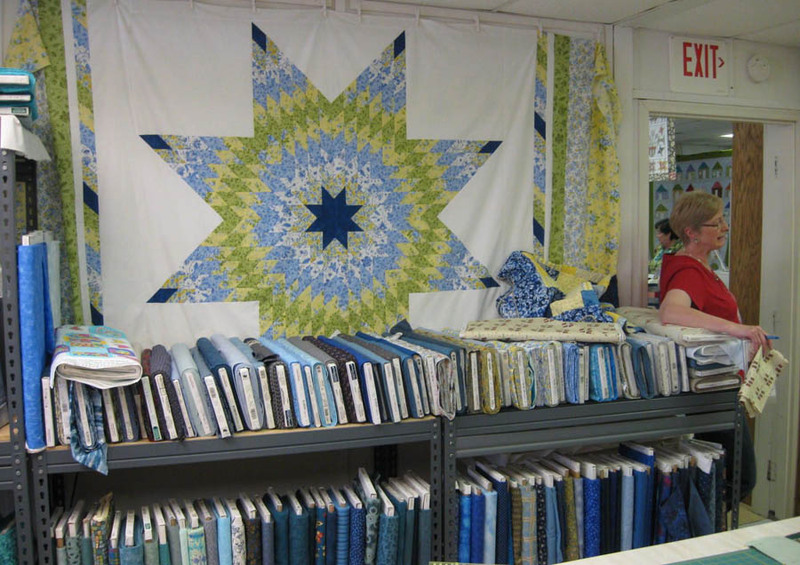 Jeanette, a former math teacher, was introduced to quilting by her sister, an avid art quilter, and jumped feet first into the deep end by attending the International Quilt Festival in Houston as one of her first forays into the world of quilt making. 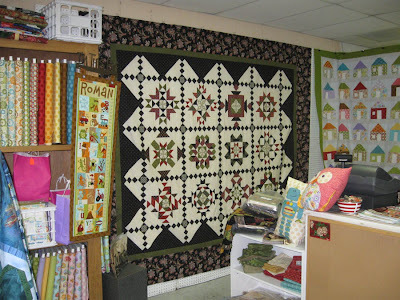 Over the past 7 years, Quilting Dreams has blossomed and grown under Jeanette's guidance and her knowledgable staff. Classes, and programs such as a Saturday Sampler and Block of the Month (BOM), are offered throughout the year and there is inspiration everywhere from the quilts hanging on the walls and from the ceilings, to the project samples and displays of fabric bundles and Fabrications strips situated throughout the shop. 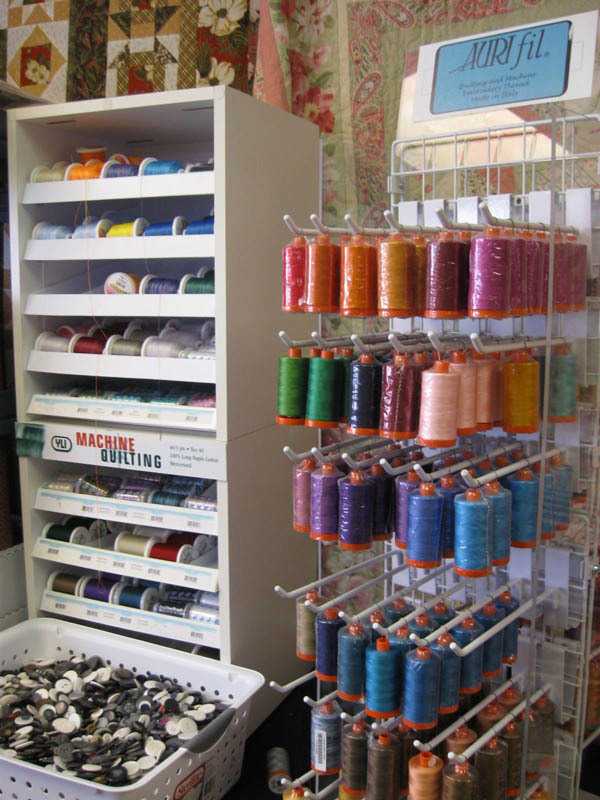 In addition to over 2300 bolts of fabrics, Quilting Dreams offers an extensive selection of patterns for quilts large and small, wearables, home fashions, quick projects and fun-to-make quilter's accouterments like pin cushions and thread catchers. 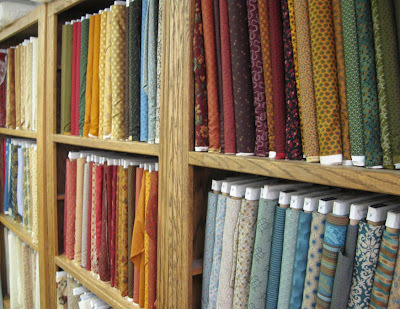 A large selection of cotton fabrics are arranged by color. Patterns for various projects are on display. Quilting threads by Aurifil and YLI . 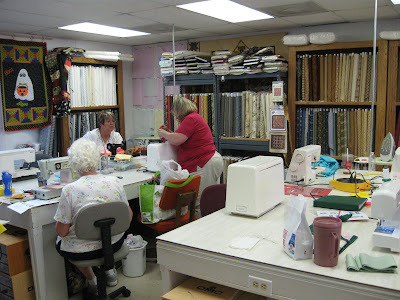 The shop occupies two large rooms. 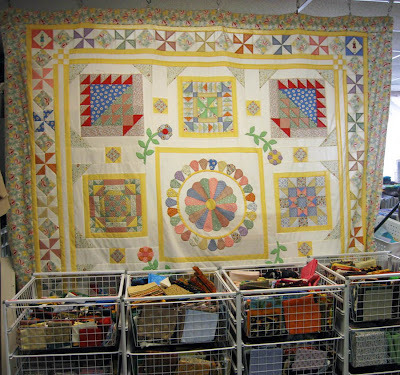 The classroom area shares one of these rooms with baskets of fat quarters, shelves of bolted fabrics and quilt tops hanging on the walls. A quilt top hangs in the classroom. 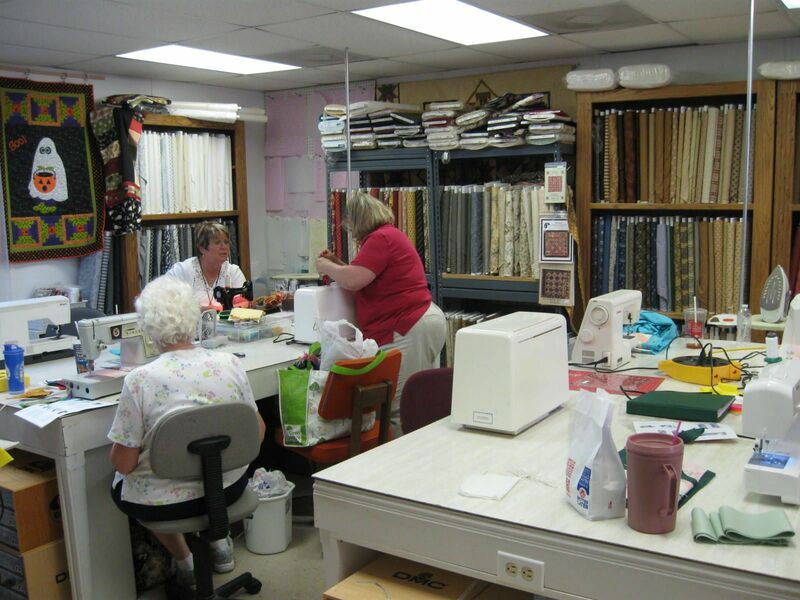 During my visit, several new quilters were learning how to achieve accurate 1/4" seams in a Beginning Quilting class. 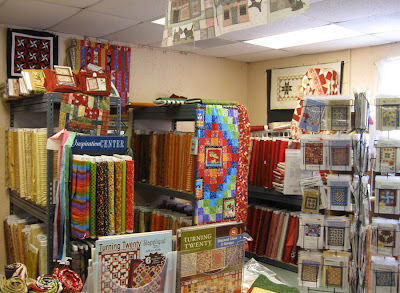 Beginning quilters in the classroom at Quilting Dreams. 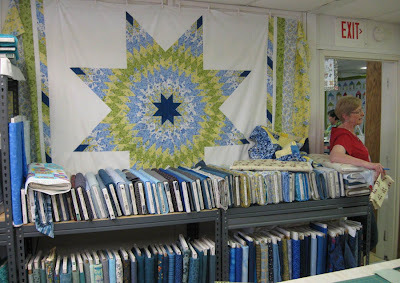 This Lone Star quilt hangs in the classroom above bolts of blue fabrics. Jeanette is always on the lookout for new products, techniques and programs for her customers. She attends quilt market and schoolhouse sessions to learn about the latest trends. Over 2300 bolts of 100% cotton quilting fabrics. When the store was remodeled, the entrance relocated to the back of the building to be adjacent to the spacious parking lot. SW Atlantic Street runs parallel to the railroad tracks and the sign (photo above) is at the sidewalk and entrance to the parking lot. 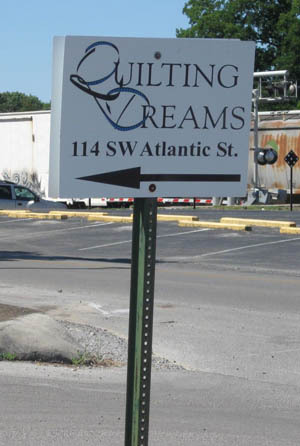 Follow the sign and you'll arrive at the door of Quilting Dreams, a dream of a quilt shop. Quilting Dreams quilt shop at 114 SW Atlantic Street, in Tullahoma, TN.